After my last dyeing adventure I was very keen to have another go. A new bigger pyrex dish arrived (eventually, after some fun where the first one was lobbed over the 7' gate to my back garden by the delivery guy, and of course smashed). The dish I bought was the biggest I could find that would fit into my microwave and it has much more space to dye in, which makes it easier. I decided I wanted some purple yarn so went heavy on the purple and red and added a dash of blue colouring. I might have gone a bit too heavy on the dye. It took eons to rinse the yarn as there was so much left over after the yarn was saturated. I learnt that I really don't need very much of the Wilton's Gel. The resulting yarn, however, was amazing. I was so happy with it. I also really love this yarn base. I may have to order some more BFL yarn because it resisted felting really well, despite all the rinsing that was required. 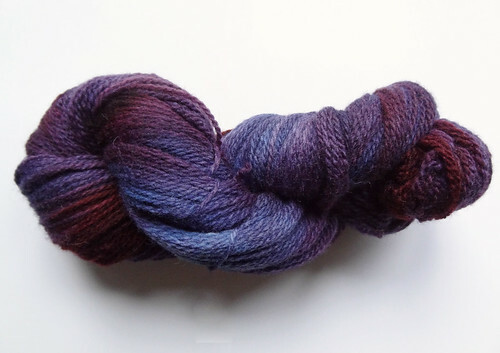 On the same day, that I dyed this, I decided that I would try dyeing some of the Superwash Merino fibre I bought. I wanted to try a completely different colour scheme, so went with the cream and yellow colours. I mixed it throroughly together and used a lot less of the colour. I added the soaked fibre to the mixed dye and then when it had absorbed the yellow dye, I added a couple of splashes of green to the top. 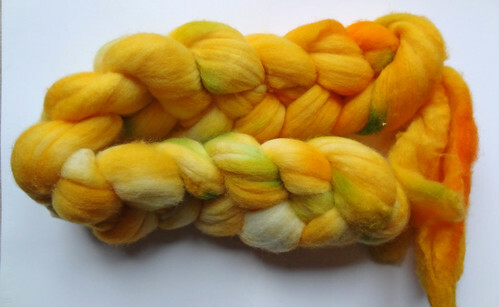 I love the vibrancy of this fibre. The fibre is still amazingly soft, which I was not expecting, for some reason. I would never buy this sort of coloured fibre normally. I normally only buy my absolute favourite colours of fibre, which means there isn't much variety in my fibre. Dyeing the fibre myself is giving me free rein to choose different colours to my normal top of the list choices. I've started spinning it already because it is perfectly sunny for the currently grey weather. 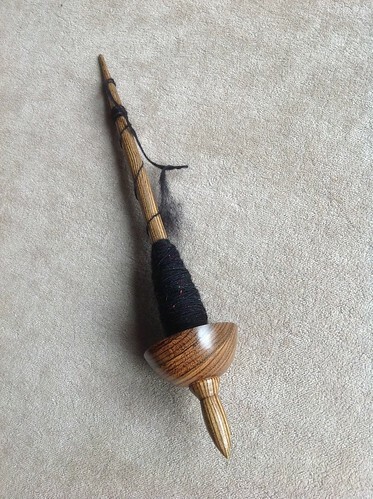 I'm using my brand new Enid Ashcroft Bocote spindle that I managed to score on an ETSY update. I was amazed that I managed to find this spindle because it is meant to be quite difficult to find the updates for this maker, as they are not frequent and the quality is meant to be excellent. I just stumbled over the spindle when I was browsing supported spindles on ETSY and when I saw this for sale, I knew it was meant to be mine! It is amazing. It spins like a dream. The sample above was made from some merino and sparkle punis from Fondant Fibre. 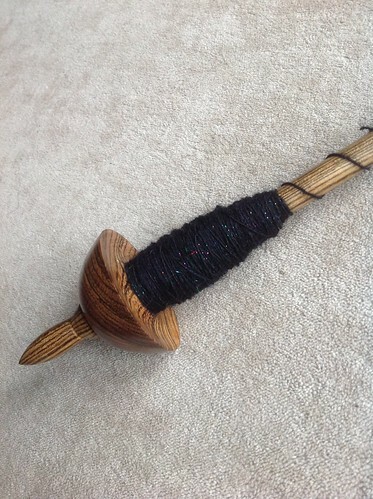 It was so much fun to spin as both the punis and the spindle were gorgeous to use. If you are in the market for a spindle and you ever stumble over an update, I urge you to not hesitate. There were some gorgeous Turkish spindles in the shop yesterday and they are now gone. I was tempted to buy one, despite knowing I can't use a drop spindle, because they were so beautiful. I am not spinning my yellow fibre with any kind of intention, I am just spinning it for fun, because it is pretty and it makes me happy. I'll dye some more fibre when I get near the end of this. Dyeing is so much fun and I can't wait to give it another go I'm so glad I bought a decent amount of this fibre because it survived a learner dyeing it, and is still lovely to spin. I think it's just as well I am too sick to dye often because I would be over-flowing with hand dyed fibre and yarn within a very short amount of time.